I'm not sure about what is original and what was modified over Ravat's 34 years of life to date, but I am certain that I didn't like it. 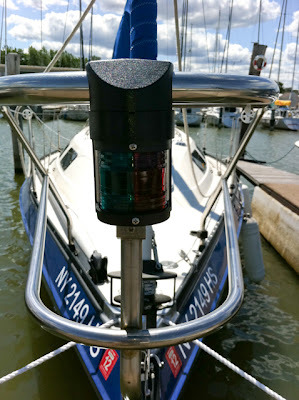 The stern 180 degree light was a small incandescent Perko vertical mount unit which is still available through West Marine, although most other stores do not seem to advertise it. The bow rail has an Aqua Signal Series 40 light mounted to a stainless bracket which was welded in place. when I connected the wires after launching, neither light worked. The first decision I had to wrestle with was whether or not to go with LED lighting. From a pure design perspective, it's not much of a decision. It's the best option in terms of reliability, long term cost, and energy efficiency. And yet, I went with incandescent lighting. I don't do a lot of sailing at night, in fact, I would usually sail until sunset, then get back to port within an hour, and then motor to my slip. With that in mind, the energy reduction benefit of LEDs was significantly reduced due to my usage. As this is one of (way, way, way) too many projects in flight right now, the budget could be reduced substantially by selecting a unit that offers a quality housing and a well known upgrade path to LED bulbs. The Aqua Signal Series 25 lights meet those criteria. 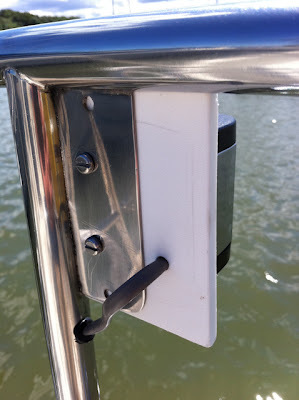 They are size-appropriate to my boat, offer mounting options that suit my needs, and are extremely reasonable in price. Did I mention they are available just about everywhere as well? Nice. In my opinion the AS Series 40 is far to large for a pleasing proportion on the CS27's delicate bow. I liked the slick welded mount, but really never liked the light there. What really decided the fate of this upgrade was that no matter what I did, I could not get the bulb to stay on any better than intermittently. That, one might think, could be a problem at night. While there are many options, I decided to go with the Aqua Signal Series 25 lights because they are very inexpensive, and yet every bit as good quality as the old one that lasted over 30 years. The smaller size makes a much more pleasing effect on the bow rail. The Perko stern light seemed a bit too small to me, although that's not really a significant complaint, nor was it the reason I decided to ditch it. When I opened up the fixture to see if 12V was appearing at the socket, I got a good close look at the lens. It should be clear, but the center 50% has frosted to white. This, no doubt, had a negative effect on the light's visibility at night. On closer inspection, it appears that at some point in time the bulb, or something extremely hot, had melted into the plastic lens. This doesn't seem like a good situation. Further, the socket was in pretty bad shape. The stern light required little more than drilling new holes in the stainless bracket which is welded to the rail. However, to make the job "right" I needed to go one step farther. The AS25 light is about an inch wider than the original Perko light. This extra width protrudes beyond the stainless plate, and would be vulnerable to bumping. Over time, a crack could develop, or the light could be knocked off. This seems entirely avoidable to me. To address this, I created a new bracket out of 1/4" marine lumber (StarBoard). It could just as easily have been a piece of 1/4" FRP, but I didn't want to have to finish it. This piece then mounted between the light and the bracket to provide a bit more support in the event of a bump. The wiring enters through the lower corner screw hole rather than the center because the normal wire path is covered by the stainless bracket. The installation is strong, and looks good as well. No matter how I tried, I could not come up with a good way to mount the AS25 light to the AS40 bracket. I ran through every combination of zip ties, duct tape, epoxy, drilling, and bolts that my imagination could muster. Not gonna happen. I'm much happier with the solution I ended up using though. Aqua Signal makes a rail mount bracket which works wonderfully. The only problem is that it costs nearly $60 to mount a $25 light. I wasn't so happy about that, but it was the right thing to do, and by far more elegant than any alternative I could arrive at. So, I bit the bullet and ordered the bracket. The bracket was a bit of a puzzle to assemble as it came with no instructions. I wouldn't quite call it intuitive, by process of elimination and some head scratching came through for me. The only modification I had to make involved a Dremel tool to help the bracket accept the profile of the curved rail. Minor grinding was all it needed. The final step was to hook it all back up. I left the original wiring in place, although I didn't really want to. It was not good tinned marine wire, but it was already fished through the rails, and I really didn't want to spend the next two days messing with it, or worse yet, remove the rails tat I had bedded only a few months ago. So, I left a short pigtail inside the hull under each rail, and connected a new 16/2 tinned wire for the run back to the wiring panel. I have a DC breaker which feeds a Blue Seas Dual-Bus which I use for my Nav Lighting devices. 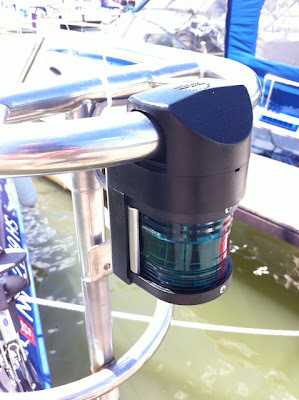 Not only does it feed the bow and stern light, but it also provides power to back-light my compasses. All connections were made using tinned heat shrink ring terminals which I obtained through GenuineDealz.com.